The recently staged Lymington Seafood Festival in the New Forest was such a success that an event for 2018 is already being planned. BASINGSTOKE, England - Sept. 19, 2017 - PRLog -- The recently staged, inaugural Seafood Festival in Lymington, New Forest, saw over 15,000 tourists and locals head to Bath Road Park on the banks of the Lymington River, for the two-day event staged over a weekend in August. Organisers have announced that plans for a 2018 extravaganza are already underway, for what is now hoped will become an annual event in the New Forest calendar. Comments Anthony Climpson, Chief executive of Go New Forest, the body responsible for promoting the region and who partnered the communications for the event with the main organiser, Lighthouse Marketing: "This inaugural festival was everything we could have hoped for, fabulous weather; lots of happy, relaxed people, enjoying a great waterside location that has for years been waiting for such a brilliant event. "We've now got a 'free-to-attend' seafood festival that will run for years and years, benefitting so many local businesses, and we are already talking about dates for 2018." 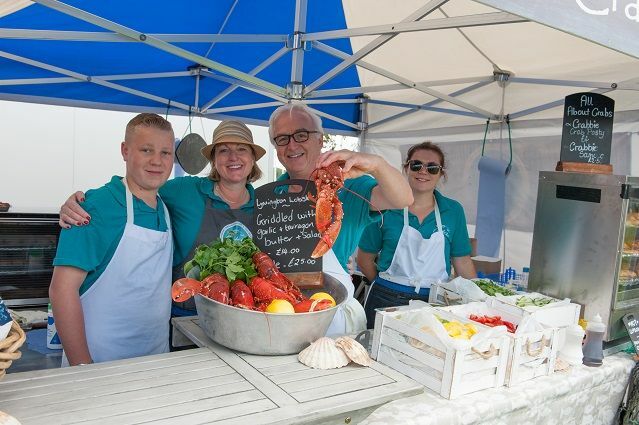 The two-day event saw 67 stall holders from across Dorset and Hampshire tempt visitors with over 130 types of food or drink, as it set out to showcase Lymington and the New Forest as one of the UK's leading foodie destinations. Visitors were entertained by live music across the weekend and could learn culinary tips at cooking demonstrations staged by 20 of the region's top chefs, who took to the stage to show off their skills and celebrate the produce the New Forest and its coastline has to offer. Comments Richard Nowell of Lighthouse Marketing: "We worked hard to ensure as many local producers as possible were represented, our ethos was that 'everyone must win'. Whether it was a stall holder, a local business on the high street who we understand enjoyed a bumper trading weekend, or BLUE our charity who we are raising money for, we simply wanted everyone to benefit from the event." The Blue Marine Foundation's Solent Oyster Restoration Project, is the charity backed by local Olympic sailing legend Sir Ben Ainslie, which is working to raise £250,000 to help restore and cultivate the native oyster back to the Solent. A project that will have long term benefits to both the marine ecosystem and businesses linked to the food tourism and fishing economies. For further information about the New Forest visit www.thenewforest.co.uk.